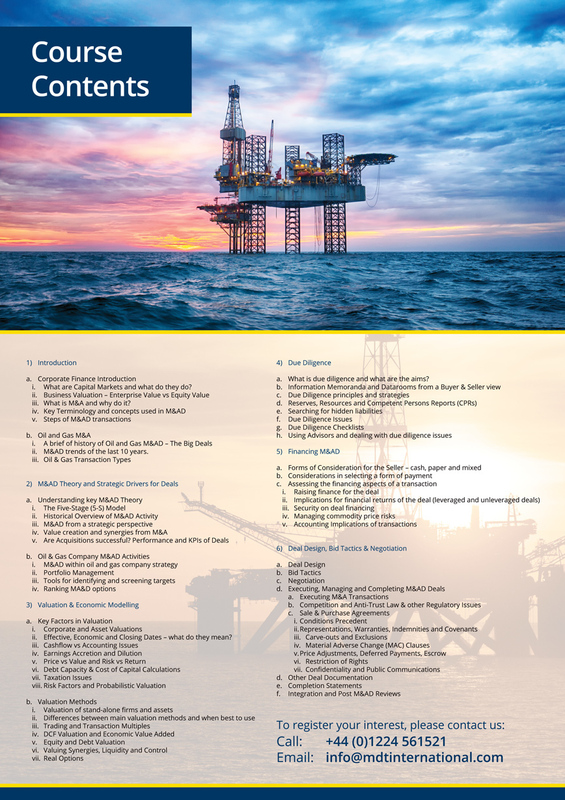 This training course combines the key theoretical principles of mergers and acquisitions with their practical application to the upstream oil and gas industry environment. In a very volatile commodity price world over the past 6 years, companies have sought to both protect their position, take advantage of value accretion and portfolio synergy opportunities as well as prepare for future growth through very active MA&D strategies. This course seeks to take participants on a journey through the MA&D process building key skills in corporate finance, MA&D strategy, valuation, due diligence, financing, negotiation, deal execution and integration. The process is looked at both from a corporate and asset deal perspective and also the viewpoints of both buyers and sellers. The course will give participants a sound understanding of MA&D activity trends, the processes involved and introduce and develop the various skills needed to successfully execute MA&D transactions large or small. 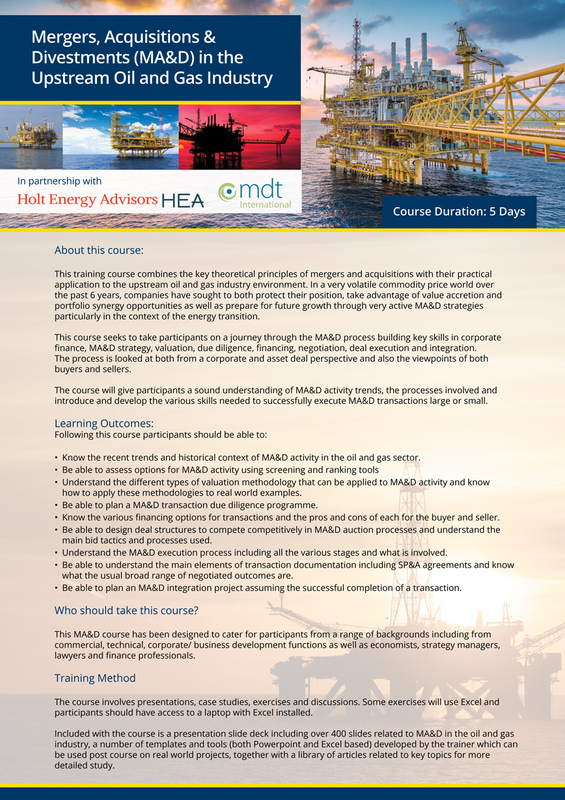 • Know the recent trends and historical context of MA&D activity in the oil and gas sector. • Understand the different types of valuation methodology that can be applied to MA&D activity and know how to apply these methodologies to real world examples. • Be able to plan a MA&D transaction due diligence programme. • Know the various financing options for transactions and the pros and cons of each for the buyer and seller. • Be able to design deal structures to compete competitively in MA&D auction processes and understand the main bid tactics and processes used. 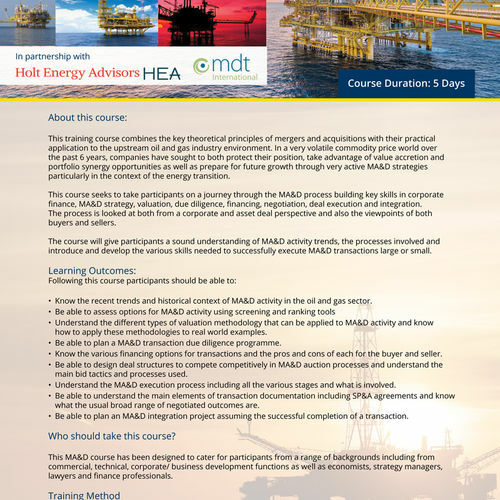 • Understand the MA&D execution process including all the various stages and what is involved. • Be able to understand the main elements of transaction documentation including SP&A agreements and know what the usual broad range of negotiated outcomes are. • Be able to plan an MA&D integration project assuming the successful completion of a transaction. The course involves presentations, case studies, exercises and discussions. Some exercises will use Excel and participants should have access to a laptop with Excel installed. 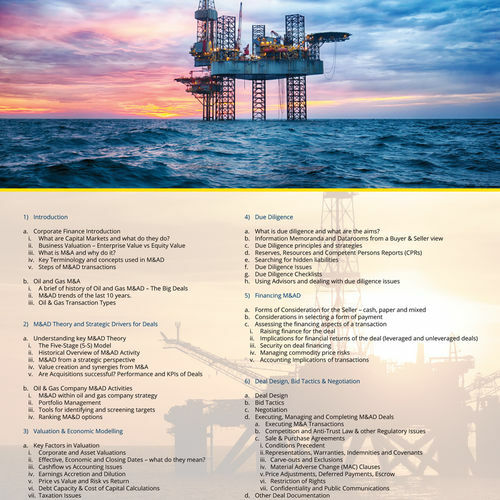 Included with the course is a presentation slide deck including over 400 slides related to MA&D in the oil and gas industry, a number of templates and tools (both Powerpoint and Excel based) developed by the trainer which can be used post course on real world projects, together with a library of articles related to key topics for more detailed study. This course is available to be booked in house and will also be run publicly during June 2019 in London and other locations shortly thereafter. Add your details below to be sent further details. Please submit your details below to be kept updated on dates and locations of training for this course.